Attention, people of Mountain View, Calif. Don’t call the police on those pod-like vehicles now roaming your suburban streets. They’re just Google’s autonomous two-person vehicles getting the lay of the land. After months of fine tuning at Google’s private testing facility in central California, a few of the search company’s bubble-shaped vehicles have started to circulate around the company’s headquarters to further adapt to real world driving scenarios. Google’s self-driving cars have now hit the real world, taking to the streets of Mountain View, Calif., alongside Google’s two-dozen modified Lexus SUVs. 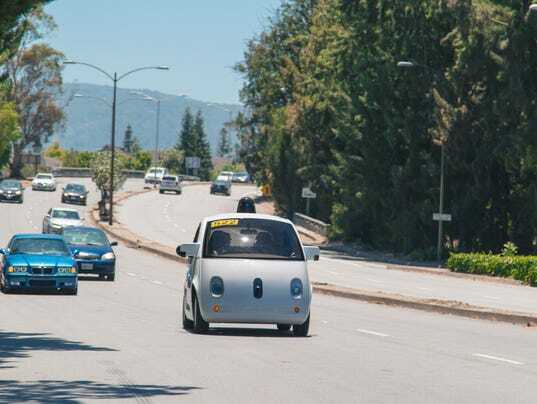 The cars represent concrete evidence of Google’s vision for self-driving cars, which amount to fully automated vehicles that can carry two people and a modest amount of groceries or other items. (There is no trunk). While these polished white prototypes do have rudimentary steering wheels and pedals for the on-board safety driver, the ultimate iteration will demand that occupants fully trust the machine to get them safely to their destination. Neighbors who wish do more than gawk or yell at these new road warriors can post their comments at a website dedicated to the project. Google also announced Thursday a competition to paint the cars with creative designs, a more down-home version of BMW’s now-famous 1970s art-car project, where famous artists such as Frank Stella and Andy Warhol used the company’s most iconic racing and production cars as their canvases. Entries for Google’s competition are open to anyone 13 and older, and are due before Aug. 30. Google has been driving the streets of Mountain View for years now with a fleet of two-dozen Lexus SUVs that are strapped with all manner of radar and Lidar sensors. In total, the cars have logged more than a million miles on city streets, resulting in about a dozen accidents that the company said were, in each case, the fault of other human drivers. Google recently agreed to keep a running web-based tally of any such incidents going forward after it was criticized for not doing so during the past few years. The Google autonomous car is a significant advancement over the Lexus mules, as much of its sophisticated tech is smoothed into its skin. But its dominant feature — a black bubble on the roof containing scanners that map the world around it in 360-degrees — is the biggest giveaway that this isn’t your father’s automobile. Self-driving cars are likely to go from sci-fi to reality rather quickly, thanks not just to Google’s long-standing efforts but also to recent commitments to the field from other tech and auto companies. Uber is busy hiring robotics engineers from Carnegie Mellon University, and Ford, announced this week that it was moving its autonomous cars efforts from a research project to a full-fledged engineering division.